If you’re a theatre fan, pool (no water) is RENT on downers. 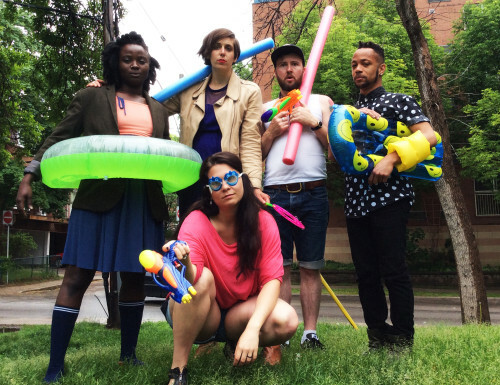 In this Toronto Fringe show, an artist hits the big time and abandons the bohemian city for splendid isolation in the tropics. A decade later, she invites four former collaborators to join her for a spell and relive the good old days: wine, art, drugs, skinny-dipping… but something goes very, very wrong — and now her “friends” have their chance at a peculiar sort of revenge. pool is an artsy play, so let’s get that out of the way. The whole thing is told by four actors as a chorus, reciting as they re-enact. (For the police? For the audience? For a video camera?) Moving as a collective and finishing one another’s sentences, it’s never entirely clear where one character begins and the other ends, and Patricia Allison’s choreography helps tremendously, reinforcing the clique’s fluidity and insularity. But what’s most impressive of all is how the cast (Chy Ryan Spain; Sarah Illitovich-Goldman; Daniel Roberts; Allison Price) and director Jill Harper collaborated to save this show at the last minute. A member of their original company pulled out just weeks before opening, but you’d never know it. Everything is so tight, sharp and polished that the 80-minute runtime flies by, and the company has a peculiar knack for nailing a sort of wide-eyed energy which could be naivete, brilliance, vengeance, insanity, or any combination therein. Mark Ravenhill’s script (originally written in the mid-90s for a UK production) is full of gifts to actors, allowing them to dive merrily into whatever takes their fancy: art, friendship, compassion, sickness, the AIDS epidemic, performance, take your pick. But if it sprawls, the focus on the collective and their behaviour over a twelve-week period anchors it firmly and gives it a good, solid thrust. I want to see it again, about six more times, to fully let it settle. I want to bring friends and family and collaborators and artists I admire, and watch it rattle around in their heads. I want to revisit it in six months, and in a year, and in five, and in ten, and so on into the horizon. This one’s going to stick with me, and it’ll stick with you, too. Be advised that this show involves graphic descriptions of a serious injury and its effects upon the body. Nothing gory or violent is shown, just described. Cast photo by Jill Harper. Photograph does not reflect final casting. It was absorbing! At one point I came too, and looked around the theater. Everyone was so rivited. The fluidity of the characters was amazing. The “what happens next” factor was off the chart! I’d see it again in a heartbeat.